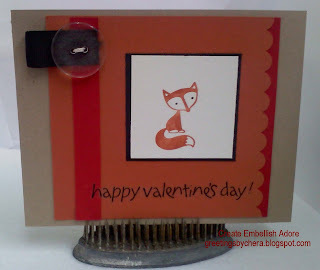 Create Embellish Adore: She's a FOXy Lady! When I saw FOX & FRIENDS in the Occasions Mini, I knew I had to have them... I mean, how cute are they? They do not have sentiments with them, and the set is a fox, lion, giraffe, owl, turtle, whale & monkey... so I gave them a try in the clear-mount style. I figured if I had to have them, and I had to try the clear- mount - this would make me use them! SURPRISE, this wood mount girl loves the clear mount. NOW- before you get all crazy and say "the clear stamps I have bought before... " blah blah blah. Listen to me.. they are still the high quality red rubber that you are already using from Stampin Up! with the foam. The Clear mount stamps still have the "image label" for them, if you are like me and have to SEE what I am doing.. its easy peasy! Your clear mount stamps arrive in a CD case like stamp case. Skinner storage! ... which means you can get more and more and more stamps!!! Ok, with that all being out of my system, here is the Foxy lady, which is being shipped off to a friend just in time for Valentines day! She is a foxy lady... inside and out! I stepped out of the norm for a Valentines card. I used the REAL RUST and KRAFT with a smidge of REAL RED and BLACK. I love it! I added a button to the Black ribbon for alittle pop to the card. She will be joining her Friends with cards for the rest of the family... how cool is that?